GALION — Entering his third season as the head coach for the Galion Tigers boys tennis team, Tom Pawsey is in rebuilding mode. Pawsey, joined by assistant coaches Terry Gribble and Alan Conner, will look to stick close to the outcome of a season ago when the Tigers finished with a 12-8 record after a 7-9 performance in 2016. But he expects to do so with many key elements of that successes gone, diplomas in hand. Lucas Conner, Nic Oehler, Matt Sparks, Landon Rose and Bryce Barnhart are all notable names that will not be taking to the court for Galion this season. Oehler and Sparks made up the Tigers’ most successful doubles team in 2017 en route to earning second-team all-conference honors. Conner and Rose was the other doubles tandem that took to the courts for Pawsey last spring. The Tigers will look to the experience of returning players Max Papenhausen, Tyler Harris, Alec Dicus, Weston Rose and Doug Harvey to guide them along in this rebuilding season. Papenhausen and Harris, alongside Gideon Johnson will be the trio responsible for providing the senior leadership in Galion’s 2018 campaign. Zach Grimes, Tyler Kruger, Kodin West, Jack Wright, Kurt Edsman, Alan Evans and Chris Amick are other players looking to make an impact for the blue and orange this spring. 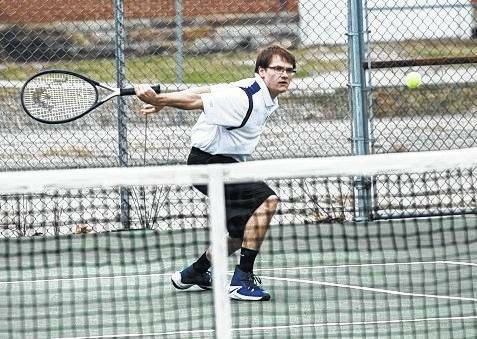 At the time of deadline, the Galion Tigers tennis squad had yet to see action. Matches originally scheduled for March 27 (at Pleasant), March 28 (home versus Kenton) and March 29 (home versus River Valley) were cancelled due to inclement weather. 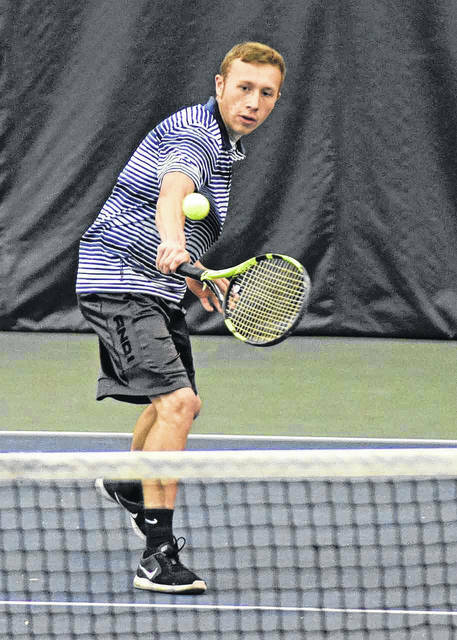 Max Papenhausen, pictured during action in the spring of 2017, will look to provide some much needed senior leadership for the Galion Tigers boys tennis team throughout this season. Galion’s Tyler Harris returns the ball during sectionals action in 2017. Harris is one of three returning seniors hoping to guide the Tigers to success on the court this season.